10 Tips For Cruising With Kids! Okay lets talk going on a cruise… for a lot of people it is maybe something they have done once for their honeymoon, or heard stories of from their parents who are retired and cruise, or have friends who work on cruse ships BUT maybe you fit none of those categories…. maybe you have kids and are wondering if it would even be enjoyable to go on a cruise? OR if it would be a week of being trapped in a giant ship with your small children wishing you had just done a road trip or stayed home and sent the kids to their grandparents while you went on a date night and called it a vacation…. This post is for you!!!! We went on not one but two cruises last year for the first time with the girls and I have put together everything I learned from that experience. I honestly wasn’t sure if cruising with kids would be fun but since going am now firmly convinced that cruising may be the most relaxing way to travel especially with kids. This post is sponsored by Royal Caribbean and our most recent cruise was in collaboration with them but it doesn’t change how I feel about cruising. Actually funny enough we went on our first cruise on our own just because we had initially planned a road trip and decided it was going to be a lot of work and not a lot of relaxing so at the last minute we booked a cruise instead. After that first cruise Royal Caribbean reached out about going on a cruise with them and we had actually already been looking at their cruises and planning our next one because we loved our first cruise so much… it was perfect timing and all of these thoughts are my own opinions! Okay but now on to the details…..
Before I share my tips I wanted to give you a little background on our cruise… sometimes I think booking a cruise can be overwhelming with all the options and rates and room choices and seeing what someone has already done can be so helpful! SO We sailed with Royal Caribbean on their largest ship Symphony of the Seas out of Miami Florida. It was a 7 night cruise stopping in St Maarten, Puerto Rico, and Haiti and then back to Miami. We had a stateroom with a balcony which was amazing because on our last cruise we only had a room with an ocean view window and being able to eat breakfast or just relax at night out on the balcony was so dreamy and so worth it. When we booked our first cruise we were not sure about a balcony especially with kids but they way they are designed I felt super safe having the girls out there during our trip and they thought it was so cool to have a balcony in our room. They even provided a crib for Ophelia to use during the trip which was so helpful and really made a difference as far as getting a good night sleep. 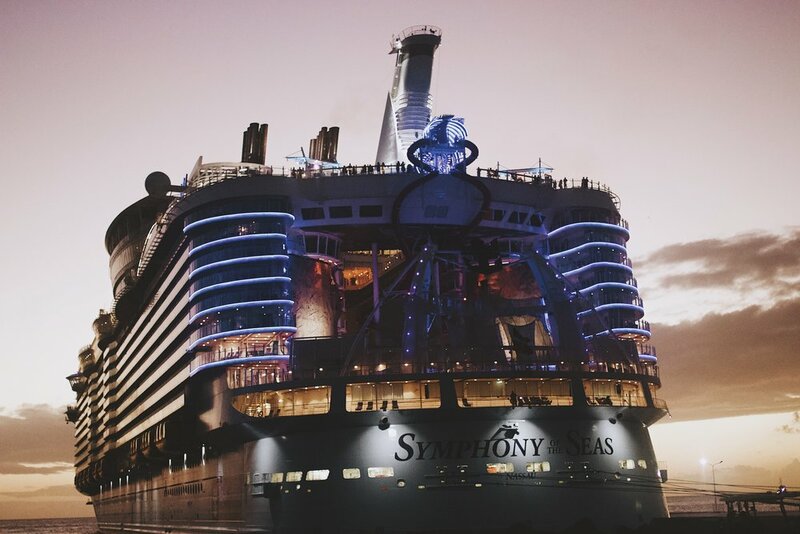 Symphony Of The Seas is an amazing ship if you haven’t googled it already… you need to! There was a carousel that I think we visited literally everyday, an ice rink, multiple swimming areas, a candy store, a zip line, laser tag, water slides, Flow riders, a 10 story slide that was totally insane, and multiple amazing shows that the girls loved and actually sat through because they were that good! I will be sharing more about our experience on Symphony of the Seas in my tips but it really was an amazing ship and I don’t think we ran out of things to do the entire time, in fact I am not even convinced we saw the whole ship it was so big and there was so much going on! I couldn’t find our exact itinerary but HERE is the closest to what we did with the exception of going to The Bahamas instead of Haiti But still on Symphony of the Seas and all other stops are the same! Okay and now on to my tips! Show up to the city your cruise departs from a day early! We flew from Denver to Miami for our cruise on Symphony of the Seas and that travel day was long. I think we ended up at our hotel at 8pm that night exhausted, excited, and hungry. The day you board the ship is an exciting and hectic day and not coming off of a long travel day will help you and your little ones enjoy it that much more. The girls spent so much time running around the ship on the first day being just crazy and excited I would have hated to have seen what that would have looked like if we had been up since 2am flying in to our destination. PLUS cruises usually sail out of pretty interesting places so having a day to explore a new place is always fun and always worth it. Pack a day bag for your first day on the ship. So we didn’t know this the first time we cruised but your luggage is checked separately and may not reach your room until that evening SO if you want to swim or do anything else that day having a backpack with you with anything and everything you might want for your kids and yourself is so worth it. We always have a general diaper bag with us because we have little kids but I threw swimsuits, and swim diapers, and a change of clothes in there too so that we all were ready to do whatever that first day whether our luggage was with us or not! The pools and all other activities are usually open so be prepared that after you board you really can start having as much fun and doing activities pretty much immediately. Bring a baby carrier not just a stroller. We always bring a stroller when we travel and on a ship like Symphony of the Seas it was super useful just with how big the ship was BUT on both cruises we noticed sometimes you would wait for a really long time for an elevator so having a baby carrier allowed me to ditch the stroller in our room and take the stairs if we were feeling the wait was going to be long. This isn’t a specific cruise ship problem it seems to be universal and not really even a problem but for us taking the stairs a lot of times was faster and more convenient. Also having a baby carrier allowed Ophelia to nap on me so that we could keep doing things during the day and not have to stop for nap time or risk skipping nap time and having a melt down. Don’t just eat at the buffet. This was a huge mistake we made on our first cruise but something we did right on Symphony of the Seas. On our first cruise we stuck to the buffet area because we were afraid our kids would disrupt the restaurants or be too picky and ruin the experience for everyone. ON Symphony of the Seas we braved the dining room and found for one that the staff was insanely helpful and obsessed with our kids so I am pretty sure they couldn’t have disrupted anyones even if they tried but also that they expected kids so the menu and experience was created to be enjoyable for everyone. Also for fancier restaurants we would feed the girls first in the buffet area and then drop them in the child center for the evening so we could go out on our own. There were so many amazing restaurants on Symphony of the Seas I am glad we did this it allowed us to eat a wide variety of amazing food and even get in a date night which on vacation never happens. Use the kid center! I had a lot of people reach out and ask me about the kid center on the cruise and mention that they were feeling guilty or nervous to book a cruise and leave their child there. SO I wanted to include this because one it is awesome that childcare is even included but also our girls had an amazing time. Every day there were new planned out activities and crafts, Jessamyn came back multiple times with her face painted and our entire room was 100 percent covered in her paintings and drawings from the kid center by the end of the trip. She would ask every moment of every day to go and I never once felt guilty leaving her because every time she had a unique and fun experience. There was also an area where we could drop off Ophelia which we did less often because it wasn’t included and had a small fee but we did leave her a couple of nights so that we could have a date and the staff was so good with her! I am pretty convinced unless you vacation to see family there aren’t a lot of places you can go where childcare is so accessible and such a good option so definitely take advantage of it! 6. Don’t skip an excursion just because you have kids with you. On our first cruise we didn’t do a single excursion mostly because we figured the girls were too young and wouldn’t enjoy it… that was a mistake. On Symphony of the Seas we did an excursion at every port and it was so amazing. In St. Maarten we went to a private beach where the girls went swimmingr, watched Iguanas steal peoples food, and turtles eat lettuce. In Puerto Rico we went on a pirate walking tour of the city, and in Haiti we took a boat to another beach that had the most amazing giant shells I have ever seen in my life! I just assumed excursions were mainly focused on adults and I was SO wrong definitely take a look at what is being offered because we definitely had fun and saw a side to each port that we wouldn’t have otherwise! Also it is worth noting that at least on Symphony of the Seas you could leave your kids in the kid center and go do an excursion so if there was something less kid friendly you wanted to do that would still be an option! 7. 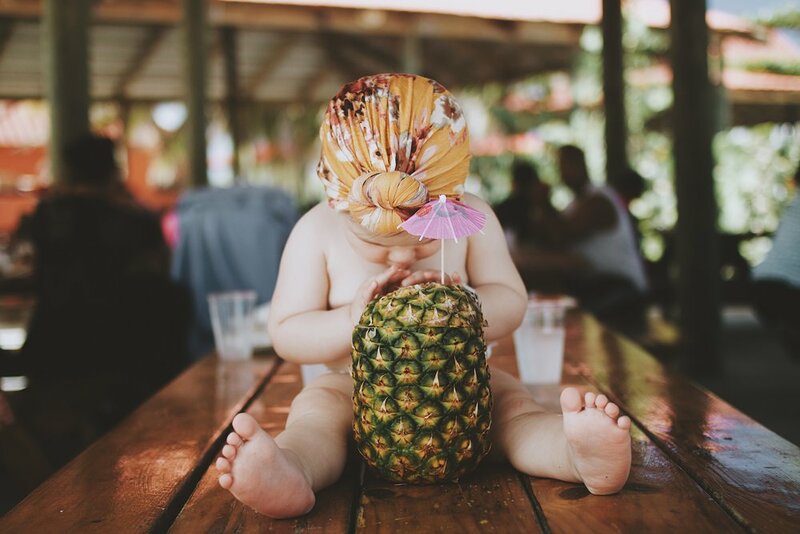 Research the rules about swim diapers before you cruise. SO on our first cruise swim diapers were not allowed which meant Ophelia couldn’t go swimming and because of that Jessamyn didn’t really get to either. It was kind of a huge bummer and something you don’t realize until you get there. With Royal Caribbean I looked ahead of time and was excited to see that swim diapers were allowed and they actually had a special splash pad pool area just for little kids which was pretty awesome. We spent a lot of time at the pool on Symphony of the Seas and both girls loved it and I loved that they were both able to enjoy it! 8. Go to the shows! I have to confess Ben and I are always super skeptical about shows on cruise ships. Our first time we didn’t go to any because we were snobs and figured they wouldn’t be very good. On board Symphony of the Seas we went to see HIRO at the aqua theater and it was amazing! It was outdoor seating and the girls totally didn’t disrupt anyone, actually Jessamyn watched the whole time and ophelia danced to the music so totally a win. it was the coolest thing I have ever seen… diving and just really really amazing theatrics and I would have watched it every night it was so impressive and unique AND I loved how kid friendly it was. 9. Make time for yourself. One thing I really like about cruising is there is usually a really amazing fitness center and outdoor running track that is often one of the least crowded places on the ship. Ben and I would take turns going to work out every day and it became one of my favorite parts of the day because it was so relaxing. I ran 3 miles every day around the track and am now scheming how to cruise full time because running while on the ocean is so calming and aI could so easily train for a full marathon on a cruise ship… it would be ridiculously fun and relaxing. 10. Utilize room service. We found on both cruises that breakfast tends to be the busiest meal as far as trying to find a table and getting everyone fed without a melt down. On Symphony of the Seas room service was included so for almost the entire trip we took advantage of that and had slow relaxing mornings in our room. I would seriously recommend checking to see if room service is included if you are going on a cruise because having that option made our days so enjoyable and kept the chaos that is usually getting up in the morning calm and peaceful. Okay yes I am already looking at cruises for this yearand wishing we could go on another one right now I am considering a 7 night cruise to Alaska THIS ONE because it stops in Juneau and Victoria among other places and looks really amazing. OR THIS ONE out of Orlando because we think it would be fun to cruise out of Orlando and because I think the stops look really awesome. Especially right now with how young the girls are and this year with me being pregnant I think a cruise sounds so much more relaxing than our normal crazy all over the place method of travel. Okay those are my tips! We are totally obsessed with cruising if you couldn't tell…. sailing on Symphony of the Seas was so much fun and I would do it again in a heart beat! If you have been on a cruise I would be curious to hear if you have any additional tips to add to this list OR if you have never been I would love to know what your dream cruise destination would be? I was joking to Ben the other day that it would be fun to set up like a group cruise and meet up with a bunch of people and cruise somewhere but I am not sure how realistic that would be or how that would even work out!